It’s National Poetry Month, and our friends Jill Davidson and Kim Stewart aka @ShelfieTalk hosted the April 4, 2016 #poetrychat. Find the Storify here. Dawn Potter @Dawn_L_Potter poet, director of The Conference of Poetry and Teaching at The Frost Place, and author of The Conversation: Learning to Be a Poet joined #poetrychat March 7, 2016 as our guest as we discussed The Pedagogy of Poetry Instruction. See the Storify here. A Walk through Nature poetry with guest host @KellyTumy was the focus of #poetrychat on February 1, 2016. See the Storify here. Poetic Resolutions was the topic of the first #poetrychat of 2016. January 4 we shared ideas on reflecting, evaluating, and helping our students set goals and resolutions. See the Storify here. Teaching Grammar with Poetry was the topic for the November 2, 2015 #poetrychat. So many great ideas and resources shared. See the Storify here. October 5, 2015 #poetrychat We talked about pairing poetry with poetry and other genres. We had several teachers join us for the first time, and boy, did they know their poetry. For some excellent suggestions on poetry pairings, see the Storify here. Poetry: the Perfect Genre for Reluctant Readers and Writers was the topic for our September 7, 2015 chat, facilitated by @aileenhower. Many ideas and poems shared about inspiring and encouraging all students to read and write. See the Storify here. Poems to Write Beside was the topic of #poetrychat July 6, 2015. Here’s the Storify with lots of beautiful, inspiring, provocative poems to write beside this summer, or to use with students to write beside next school year. I pinned the poems to my poetry board on Pintrest here. 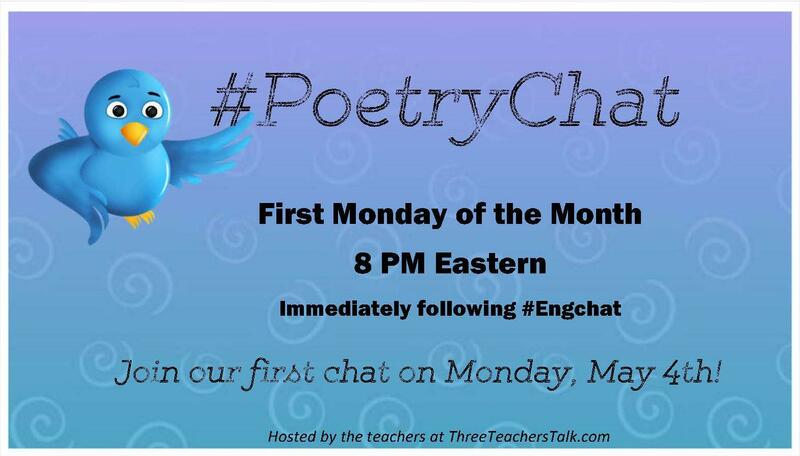 Shana hosted #poetrychat June 1, 2015. Independent Reading & Writing of Poetry. Here’s the Storify. Here is the Storify of the Inaugural Poetry Chat, May 4, 2015. Lots of great ideas for infusing poetry in our workshop classrooms. We need your help in generating themes and ideas for our first Monday of the month #poetrychat — Please jump on this doc and add your ideas. Maybe I’m a little eager. The first #poetrychat isn’t for awhile, but poetry is pretty much swimming in my head. Not very good poetry — but swimming still. I do not consider myself a poet — yet. I want to be though, so I am not giving up. Poetry is an act of peace. One line from Neruda, and I feel better. I am writing a thesis for my master for TEFL abd I have difficulties finding a definition and a list of writing skills, similar to reading skills (e.g. skimming, predicting). Would you help me by providing this informations. I would appreciate it a lot. Thnk you.